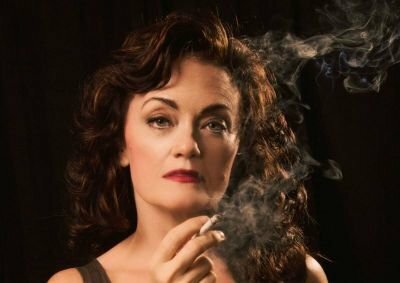 An extraordinary one-woman show that is All About Bette. Morgana Shaw's embodied performance has left audiences breahless. All About Bette star Morgana Shaw was an invited guest to walk the red carpet and give interviews for the Second Annual Women Texas Film Festival, Dallas, Texas, August 2017. "Midway through the first act, Shaw’s Bette pulls her dark velvet coat close to her and begins to talk about her four husbands, and how social norms of the time drove her to marry injudiciously. “I married people I shouldn’t have gone to dinner with,” she says, laughing and sighing at once. Morgana Shaw succeeds in the uphill battle of captivating a crowd without another actor on stage. Her ability not only to memorize two hours worth of dialogue, but to transform herself through multiple decades and varied characters is worthy of high praise. She and director Ryan Matthieu Smith have creatively crafted an endless array of dramatic scenes with barely a prop or scenic element on stage. 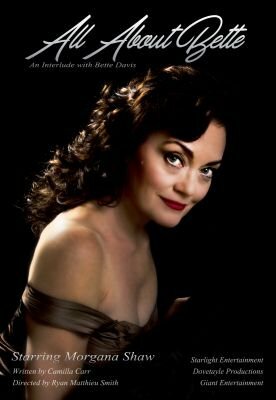 An award-winning veteran of theatre, film and television, she is happy to be back on stage as Bette Davis in the role she originated in 2006. MICHAEL A. JENKINS (Producer) is a four-time Tony® Award winner as a producer. Ken is a producer, director, writer and actor in Dallas/Ft Worth. Joy is a Dallas/Ft Worth based photographer and stylist. Review of the Memphis Film Festival screening of the charming and sweet SHOOT THE MOON RIGHT BETWEEN THE EYES, starring a "wonderful" Morgana Shaw.